Eight sacks containing an estimated 7,500 Christmas cards were delivered to Marks & Spencer in Peterborough last Thursday by Peterborough Cathedral. The cards were all donated via the collection point inside the cathedral and will be added to the total being gathered for recycling by Marks & Spencer nationally. The retailer is working with the Woodland Trust to plant a tree for every 1,000 cards donated. The Dean of Peterborough the Very Revd Charles Taylor handed the cards over to Glyn Morgan and Barry Harker from the firm. He said: “We would like to thank Marks & Spencer for running this excellent scheme, and also to thank everyone who made a point of coming to the cathedral to drop off their cards. 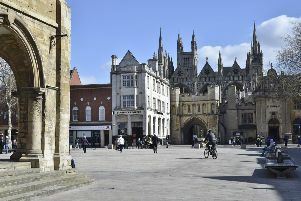 “It’s heartening to think that we have helped to plant another seven and a half trees.” It is the first year the cathedral has offered a collection point having heard about getting involved in the scheme from Peterborough Environment City Trust.